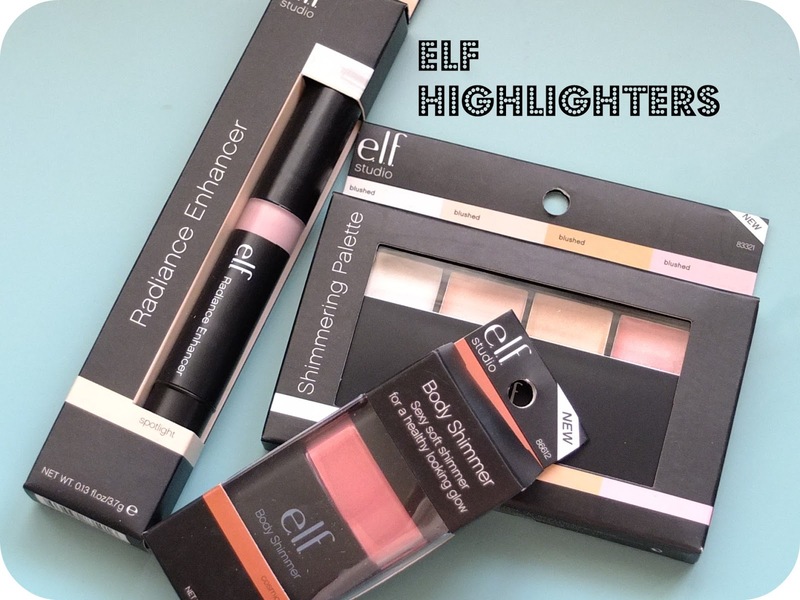 A Trio of Budget Highlighters from ELF. ELF ELF ELF. Oh what a cute brand name you are abbreviated to. I really like ELF comestics, mainly because they’re cheap, and I like buying cheap stuff, because I’m tight like that. Don’t get me wrong, sometimes ELF can be a little Hit and Miss, but even if you get a miss who cares when it’s cost you like 2 quid an item! Highlighters are my favourite thing in life, well not in life, just in my make up collection. They instantly make your face a little dewy, give you a healthy glow and even make my Dr Seuss nose seem a little bit more upturned. I generally apply highlighters to my cheekbones (yeah they’re there somewhere amongst these hamster chops of mine) and down the centre parts of my face? Does that even make sense? A dab on the T Zone, nose and chin. Is this the right way to use Highlighters? I don’t even know, but sometimes it’s nice to smoosh your face in ALL THE PRODUCTS in EVERY WAY EVER isn’t it? So the selection I’m featuring from ELF are all used in different ways really. The ‘ELF Studio Body Shimmer’ I haven’t used anywhere on my body…. 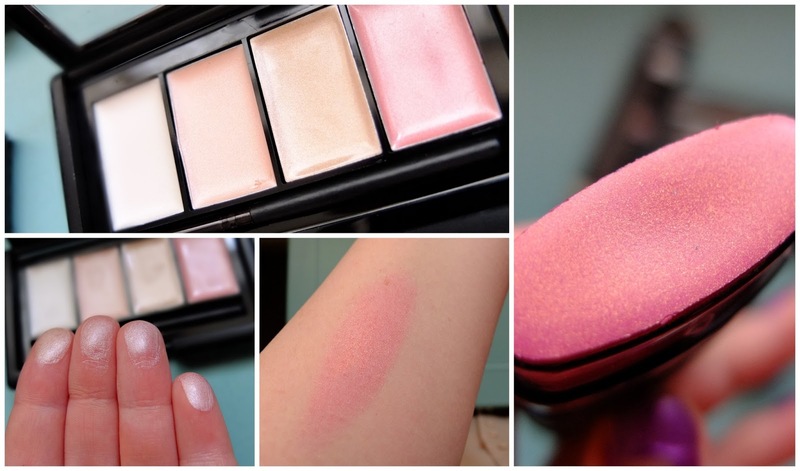 Well apart from on my arm in the swatch below (it’s not a real review without swatches after all!) I found the coral-pink shade with gold glitter running through is a little too colourful to use anywhere else apart from my cheeks, and this gives such a lovely tone and highlight as a blusher. The stick is a little ‘hard’ so it’s worth noting it you want to use this after something like a powder foundation as it’s likely to pull that base right off your chops, but you can make it work with the right technique. The Shimmer Palette is a lovely little selection of 4 different tones of highlighter all in a soft creamy formula, I love the pinkish gold one which is second in from the right in the image below. It’s a lovely warm highlighter. These can be applied slickly with your fingers, or if you have a small concealer brush they can be blended in to well, where ever your little face desires. They are incredibly slick though, so I can’t imagine their staying power around the eyes would prove to be too successful as they seem like crease-city to me. 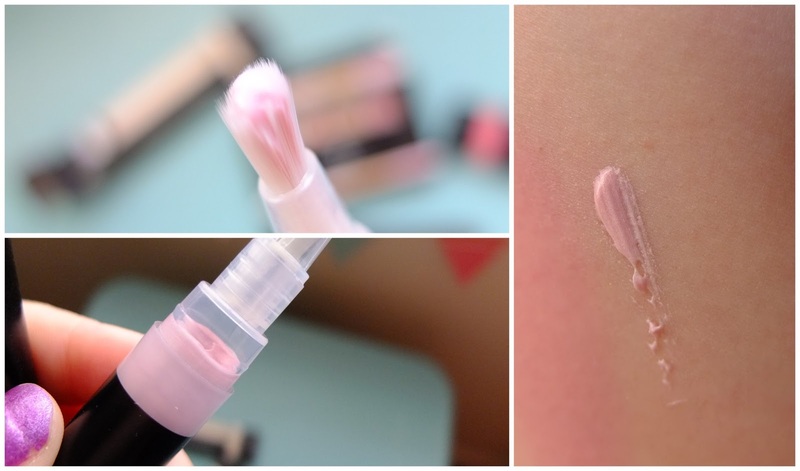 The ELF Radiance Enhancer is probably the most versatile of the bunch, despite it’s quite cheap feeling brush, the creamy substance within is a lovely subtly pink shimmer which can be used alone on brow and cheek bones or splodge a bit extra out and mix it in with your foundation for an all over diffusing and dewy glow. With these three budget highlighters you’re looking at less than £4 for each one, so a pretty cheap introduction if you’ve not tried any before. Give them a whirl, you might like it. Next Post Burt’s Bees and Matalan Offers!